The word “Mala” is the Sanskrit meaning for rosary or prayer beads. Malas are used in many cultures as practical aids during meditation, but also on a broader level to focus intention, manifest dreams and wishes, and to heal, nurture and support your personal and physical journey to wellbeing. Traditional malas range in size from 27, 54, or 108 beads. 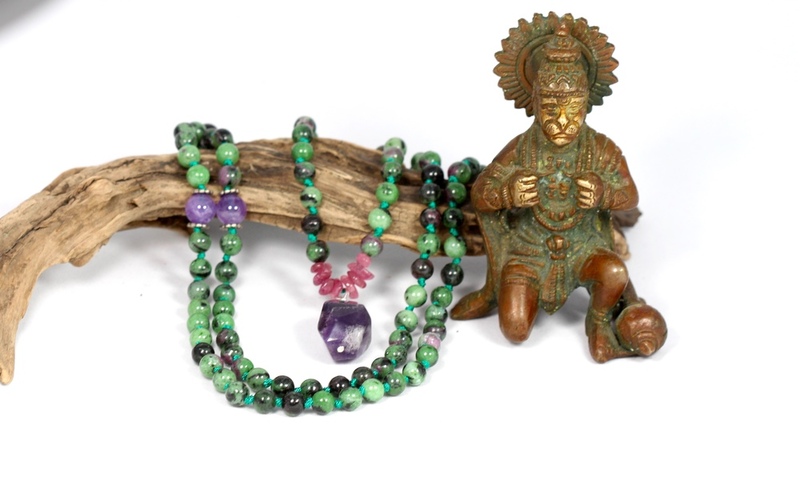 Most malas have 108 beads and a larger “guru” bead said to hold the energy generated during the meditation practice. The number 108 is a sacred number predating Buddhism. It’s the classical number of the names given to a Hindu deity or god. It is also a multiple of 12 and 9, representing the 9 planets and 12 Zodiac signs. As a multiple of 27 and 4, it also represents the quarters of the moon in each of the 27 lunar constellations. In Pranayana Yoga it is said that a person takes 21,600 breaths in a day consisting of 60 periods of 360 breaths; a 12-hour ‘day’ cycle would therefore equal 1,800 breaths. 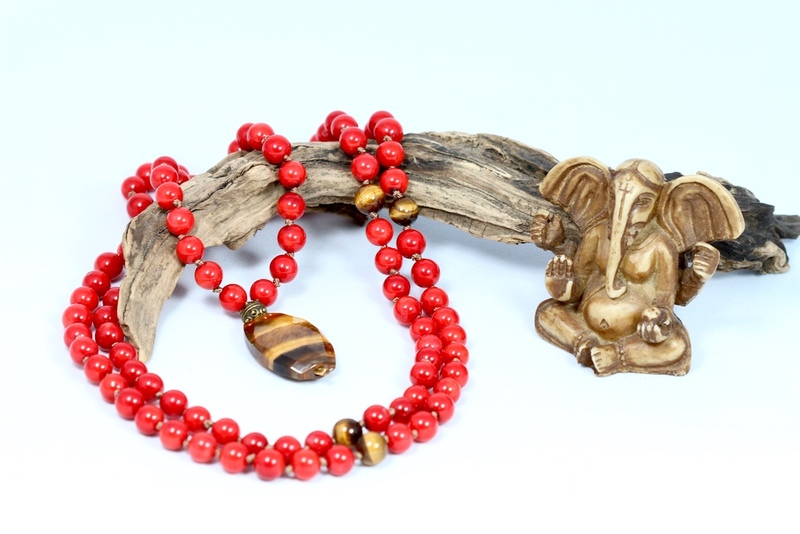 Malas aid the practitioner in counting mantras (or prayers) while allowing one to focus their awareness on the mantra. However, you need not get stuck on having to choose a particular mantra to use a mala. You may decide to just focus your attention on your breath as you move up the beads. Meditation is a practice, and any time you allow yourself to sit in stillness you are bringing awareness to the present moment. What color and beauty speaks to you? What gemstones “speak to you” from a strictly aesthetic standpoint? Are there certain colors that you’re drawn to? Listen to your heart, and it will often lead you to your perfect mala. What healing properties do you desire? Most gemstones have energetic vibration that enhance their healing properties. Are you looking to heal some area in your life? Are you looking to manifest a particular healing property? I can help guide you in choosing your bead or I can intuitively decide for you. How will you use your mala? Hand Knotted or Wire Strung is a question to consider. Will you be using your mala strictly for meditation or do you plan to wear it like a beautiful piece of jewelry as well? Some people like the feel of the knots as they move up their mala in meditation. Hand knotting is best for malas that are made using one size bead (e.g. all 8mm). When creating a mala that features beads of varying size, I typically use a wire. One is not necessarily better than the other. It’s just a matter or preference. How many gemstones do you desire? When making custom malas I remind people to try and keep the number of different stones to 2 or 3, especially if you’re looking at it from the healing properties of the stones. Keeping it to 2-3 will add strength to your intention, versus trying to imbue one piece with many properites. Of course, if you’re choosing your mala based solely on color and are drawn to several different colors then that is certainly your choice. Keep in mind this is your mala. The most important thing is to choose one that makes you feel good and aids you in your personal journey.